Is this newly described antechinus at Springbrook in trouble? 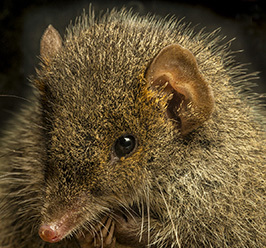 An antechinus found in the McPherson and Border Ranges area has been described as a new species. But its future may be dim. The Dusky Antechinus population recorded in this area was previously described as a subspecies, Antechinus swainsonii mimetes. Other subspecies of Antechinus swainsonii occur in Tasmania and along the eastern coast of the mainland. Researchers at Queensland University of Technology have shown that the population in this area is sufficiently different from other subspecies to be regarded as a species in its own right. They have named it Antechinus arktos with the common name of Black-tailed Antechinus. The specific epithet, arktos, is Greek for bear, chosen because of the long guard hairs over the body and the tendency to rear on its hind legs sniffing the air when disturbed. This differs from the acrobatic leaping exhibited by other species when disturbed. The Black-tailed Antechinus differs from the Dusky Antechinus in having orange-brown fur on the face and a black tail. It occurs only in high rainfall rainforests where rainfall is augmented by fog drip (cloud forests). Its range is considered to be from Springbrook in the north east to eastern Lamington Plateau to the west and Tweed Range in Border Ranges National Park to the south. Based on DNA analyses, the researchers have concluded that the Black-tailed Antechinus, which is confined to high altitude, high rainfall rainforest, became isolated from other populations of the Dusky Antechinus and evolved to become genetically different. Of concern is the failure in recent surveys to find the species in areas such as O’Reillys and Binna Burra in Lamington National Park where it has previously been recorded. Dr Andrew Baker, the research team leader at QUT, has applied for the species to be listed as endangered and believes its apparent decline may be due to climate change. Australia has the worst record for mammal extinctions with 27 species extinct since European settlement. No antechinus has been recorded as having become extinct. Dr Baker and his PhD student, Emma Gray, are studying the ecology of the Black-tailed Antechinus at Springbrook with support from ARCS.